Mish's Global Economic Trend Analysis: Huge Trade in Fake Syrian Passports; Start of "Real Exodus; 6.5 Million Displaced; "Everyone Wants Out"
Huge Trade in Fake Syrian Passports; Start of "Real Exodus; 6.5 Million Displaced; "Everyone Wants Out"
For those hoping to leave from wherever to EU countries, the passport of choice is Syrian. Preferential treatment Syrians receive in Germany and Sweden has turned Syrian passports into desired, and valuable documents. And with the increased demand comes passport theft and forgery. In a process known as ghost travel, still others borrow a passport from someone who looks similar, then return the passport after they arrive where they want to be. EU officials are now concerned over the Burgeoning Trade in Fake and Stolen Syrian Passports. Though most European nations have been slow to welcome more than a few Syrian refugees, the well-known preferential treatment Syrians receive within the German and Swedish asylum system has turned their passports into desired accessories for other immigrants who otherwise would not be likely qualify as refugees. At the cafe where he does his business, thronged by agitated Syrians, promises and pleads are made, and prices negotiated. Many leave, however, either put off by the price or not convinced by the vague promises of safe delivery. The German vice-chancellor repeated his call for EU countries to take their fair share of refugees, as violence flares between police and refugees on Greek island of Lesbos. "Germany Could take 500,000 Refugees a Year" for several years said vice-chancellor, Sigmar Gabriel. “I believe we could surely deal with something in the order of half a million for several years,” he told ZDF public television. “I have no doubt about that, maybe more.” Germany expects to receive 800,000 asylum seekers this year, four times the total for 2014. As Greece struggled to cope with an influx of refugees – many from war-ravaged Syria – Donald Tusk, the EU president, warned that the refugee “exodus” could last for years. “The wave of migration is not a one-time incident but the beginning of a real exodus, which only means that we will have to deal with this problem for many years to come,” he said. The UN’s refugee agency, UNHCR, said Europe must offer guaranteed relocation for Syrian refugees. About 30,000 refugees are on Greek islands, with 20,000 on Lesbos alone, it said. The island has a population of about 85,000. The vast majority of refugees and migrants in Lesbos have been forced to live out in the open, or at best in tents, with almost no access to running water or public toilets, and conditions have become increasingly squalid. “It is an intolerable situation,” said the island’s mayor, Spyros Galanos, who has appealed to residents to boycott the country’s upcoming general election and threatened to close schools later this week if relief measures and emergency action are not taken quickly. On Tuesday morning locals told Greek TV that after several days of street clashes between refugees and riot police they had reached a point where they were afraid to leave their homes. In Hungary, scores of migrants broke through a police line near a refugee centre and marched towards Budapest on Monday before agreeing to turn back. In Denmark, police closed a motorway in the south of the country as crowds headed towards the Swedish border. Venezuela said it would accept 20,000, the same number that Britain has promised to take over five years. Dilma Rousseff, the Brazilian president, declared migrants would be welcomed with “open arms”, and Chile’s leader, Michelle Bachelet, said it was “working to take a large number”. Canada’s Quebec province said it would take 3,650 this year. Rounding out a trio of exodus articles, please consider 'Everyone wants to leave': death of hope drives young Syrians to Europe. Four million Syrians have left the country and 6.5 million more are internally displaced. In government-controlled Damascus, rebel mortar bombs kill a few civilians every week. 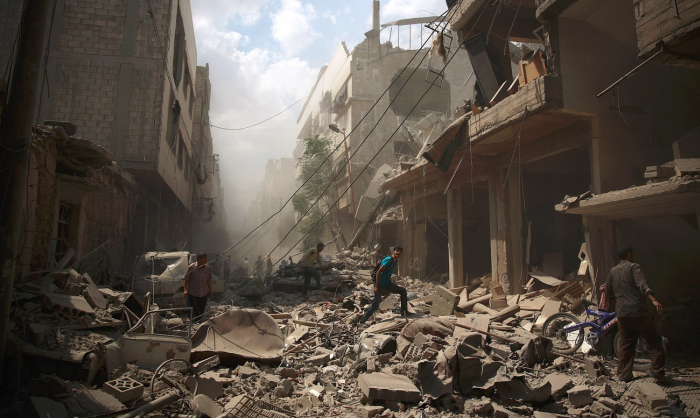 In mid-August government forces bombed the souk in nearby Douma, killing 250 people – almost two years to the day since a chemical weapons attack killed 1,300 in the same area. In many ways, Damascenes say, the abnormal has become normal. Hollow-eyed children beg outside restaurants and cafes that hum with the chatter of shisha-smoking customers. Just a few miles away, Isis is fighting the army and government militias; typhoid has broken out in the Yarmouk refugee camp. Beheadings and barrel-bombs are part of the landscape of a disintegrating country. In Damascus there is a new industry of “facilitators” who offer advice to Syrians who want to get out. Adnan, a lawyer, has helped 16 people in the past few months and has 22 on standby waiting to go. The biggest group are 17- to 25-year-olds, including students who are about to graduate but have no job prospects. But he has wealthier clients too: a 30-something head of department living in a safe part of Damascus; another man who sold his car for $5,000 – enough for a comfortable trip. 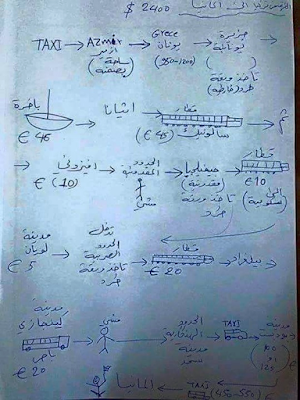 Adnan also has a handwritten diagram detailing the route from Izmir, via Macedonia, Serbia and Hungary, along with the cost of trains, buses, cheap hotels, documents and advice on key points. At the end of the journey in Germany a tiny stick figure waves a flag in triumphant celebration. And what do you do in Germany when you cannot speak German or English? Where do you get a job? 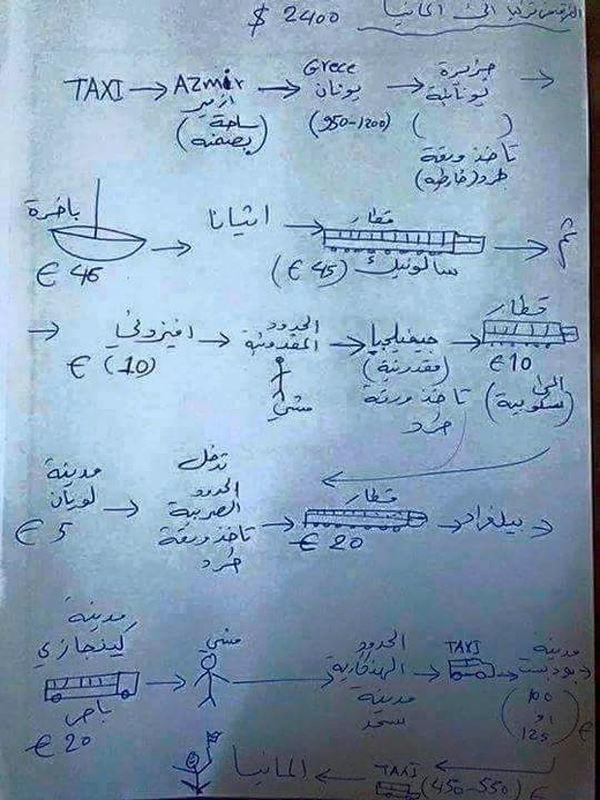 And what if you get stuck in Greece or Hungary along the way? Humanitarians demand Europe do more. But look at it this way. If Germany provided airlifts to all who wanted out, something on the order of 6.5 million displaced citizens would be takers, not the 800,000 Germany is willing to take. And it's reasonable to assume there would be another couple million non-displaced takers as well. Simply put, the easier the EU makes it on refugees to get out, the more takers there will be. Let's return to the origin of this massive mess. Here's a picture from the Guardian to consider. Syrians walk amid the rubble of destroyed buildings following reported air strikes by regime forces in Douma. Photograph: Abd Doumany/AFP/Getty Images. Please recall the mindless US overthrow of Sadaam Hussein that totally destroyed Iraq and led to the rise of ISIS. The US also provided help to Al Qaeda "moderates" in a foolish attempt to oust Syrian president Assad. Weapons instead ended up in the hands of ISIS. Russia and Iran both want to fight ISIS, but the US does not want that help because it wants to get rid of Assad. We learned nothing in Iraq, nothing in Afghanistan, and nothing from the idiotic policy of giving weapons and aid to "moderate" extremists. The very heart of this mess is US meddling.